The big question was how would we recover after our first defeat of the season and unlike last season could we push on and be contenders for the title. Matchday 16 saw us host Torino at the Franchi a club who I thought may have grown during my first two seasons in Italy but up to press that does not seem likely, well not just yet anyway but they always seem to give us a decent game and to be honest this was probably the best that I have seen them play but we managed to chalk up another three points thanks to a Maximiliano Romero goal in a 1-0 win. 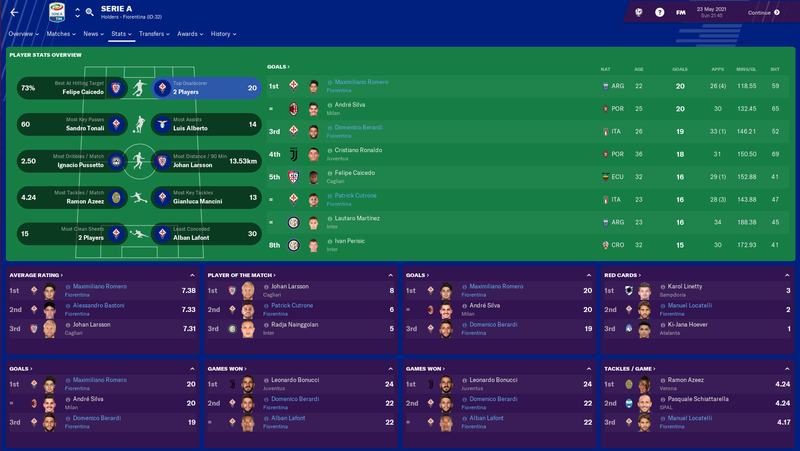 With our participation in the Europa League knockout stage confirmed I managed to rest 11 players and give the fringe or back up players a run out in a 0-0 draw at home to Braga. 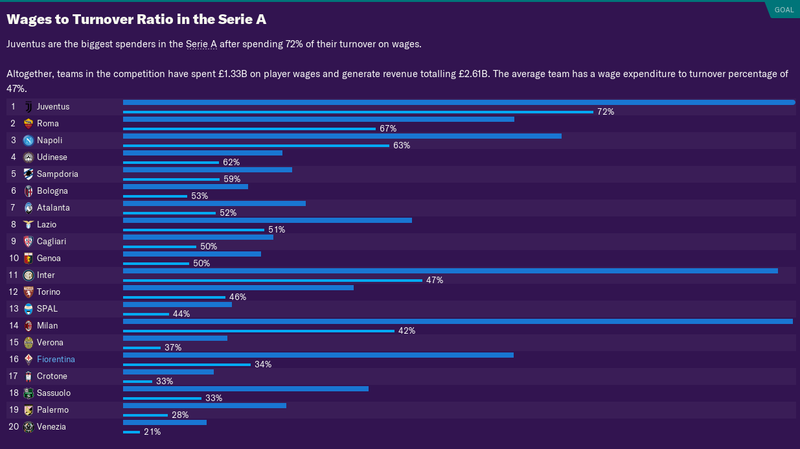 Whilst Serie A is my priority it’s always nice to progress in Europe and we have been rewarded with a mouth watering 1st knockout round tie against Manchester United. Matchday 17 threw up a trip to the San Siro to face league leaders Milan. We had no major injury problems so we rolled up with my favoured starting XI : Lafont, Ranieri, Bastoni, Mancini, Adjapong, Locattelli, Diakhate, Tonali, Romero, Cutrone and Berardi. Despite Milans league position there was only one side that looked the part and it was the side in Purple that was dominating the game and in particular Manuel Locattelli playing in the Half Back role looking like the new ‘El Pivote’ Sergio Busquets the master of the holding role. A first half Maximiliano Romero goal gives us a well deserved 1-0 lead at the break followed by Romero’s 2nd and 3rd goal in the second period gives us a fantastic 3-1 win in Milan. Romero really is looking the real deal playing the left inside forward role. A 2-1 win in the Franchi against Roma keeps us in touch with the top two, goals from Patrick Cutrone and Sandro Tonali give us all three points after another satisfying performance. We end the year with a frustrating 0-0 draw against Verona and a 1-3 defeat to Juventus despite a fourth minute strike from Romero. The year 2021 starts off well with a 2-1 win against Genoa in the Coppa Italia with a brace from Sandro Tonali. Serie A action resumes with a 1-0 win against Bologna with yet another Maximiliano Romero goal in the 85th minute finally breaking down a resilient Bologna side. A stunning hat-trick from Domenico Berardi gives us a 3-0 win in Florence against Palermo and it’s the start of the Berardi show when in the next game against Sampdoria the inside forward only goes and bags another hat-trick in another 3-0 win that takes us to the top of the table. Berardi is on fire and anybody doubting my decision to let Federico Chiesa leave the club just need to look at what our wide men are producing with, both Romero and Berardi enjoying their football, things are looking bright in the city of Florence. 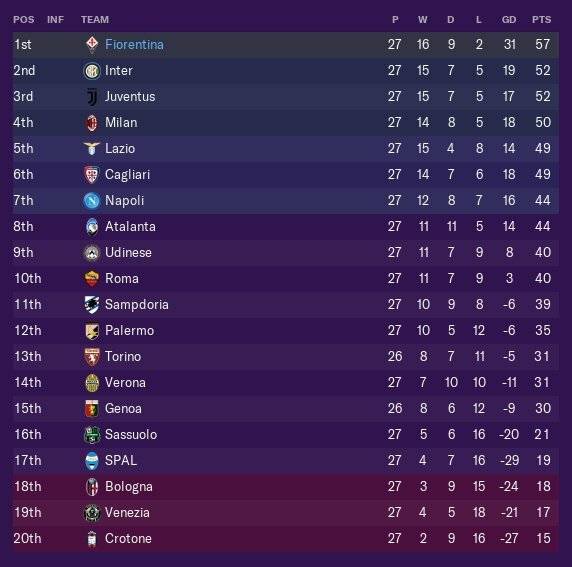 The month of January ends in defeat with Napoli knocking us out of the Coppa Italia at the quarter final stage inflicting a 1-3 defeat upon us with Berardi getting his 7th goal in 3 games. We get our revenge against Napoli just a few days later when we rock up in Naples for our Serie A fixture and give Ancelotti’s men a lesson in football with a fine all round performance coming away with a 2-0 win with strikes from Maximiliano Romero and Patrick Cutrone. It took a late Domenico Berardi goal in the 86th minute to share the spoils against an high flying Cagliari side who looked good value for money in a 1-1 draw. The Sardinian club are battling for European qualification and proved a tough nut to crack. On the subject of a tough nut to crack it was time to travel to Old Trafford to face Manchester United in the Europa League knockout stage and we found ourselves chasing the game after a double strike in the first half from Mauro Icardi. The scoreline flattered United at the break after we hit the woodwork an incredible 4 times in the first half. We dominated the 2nd half but could only score a consolation goal courtesy of Sandro Tonali in the 71st minute. An away goal in a 1-2 defeat is something for us to hang on to. We continue to keep top spot in the league with a 3-0 win at home to Sassuolo who are involved in a relegation fight. Patrick Cutrone, Domenico Berardi and Alessandro Cortinovis all get on the scoresheet. Florence was waiting in anticipation for the visit of Manchester United for the 2nd leg of our Europa League 1st knockout round game. We had a real go at United but went down 0-1 to a Paul Pogba goal that sent us out of Europe. 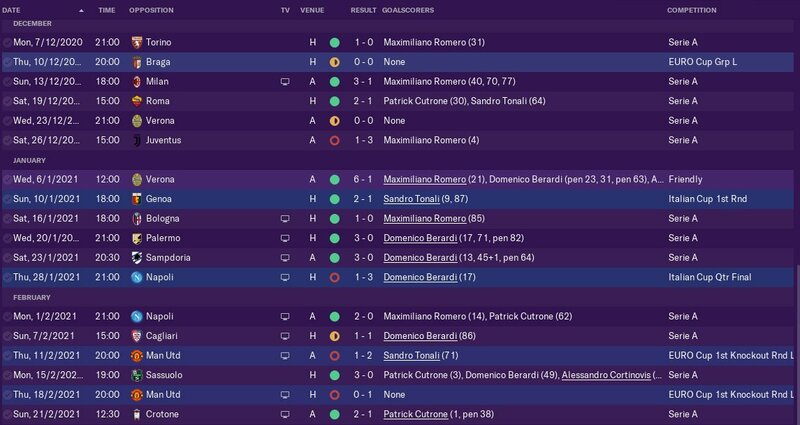 We finished February off with a 2-1 win at home against bottom club Crotone with a double strike from Patrick Cutrone which I am sure made an interesting headline the following day. Domenico Berardi put us two up in the 49th minute to the delight of the Franchi crowd. Adjapong was getting the better of Chiesa but when he did break away it was his crossfield pass that led to a Lautaro Martinez goal but it was nothing more than a consolation with us holding on for a victory that sends a message out to the rest that we are the real deal and in prime position for a title challenge. We followed up the win against Inter with another three points this time away to Genoa winning 3-1 with goals from Maximiliano Romero 2 and Sandro Tonali. We look to be in good form right now with performances looking very good on the eye. If we don’t go on to win the title now I will be gutted but we have to remain focused and take one game at a time because Zinedine Zidane and his Juventus side are on a good run and breathing down our neck. Matchday 30 saw SPAL visit Florence looking to avenge our 6-1 drubbing of them earlier in the season but they were no match for a confident looking Viola who are hungry for success as we hand them a 4-0 drubbing without our visitors recording a single shot on goal. Both Rafik Zekhnini and Domenico Berardi netting a brace that takes us in to the International break 5 Points clear of Juventus. With the international break behind us we travelled to face Udinese in what I thought would be a tricky fixture if our last few encounters are anything to go by. Rafik Zekhnini had different ideas responding to his starting call in place of the injured Maximiliano Romero by netting an hat-trick that put us well on the way to a 4-2 victory that keeps a 5 point gap between us and the old lady. Alessandro Cortinovis got our fourth late on in the game. Matchday 32 and a training ground incident that saw the local police speak to a man that appeared to be taking notes on our training session, it does not seem to affect us and the chap is encouraged to move on. 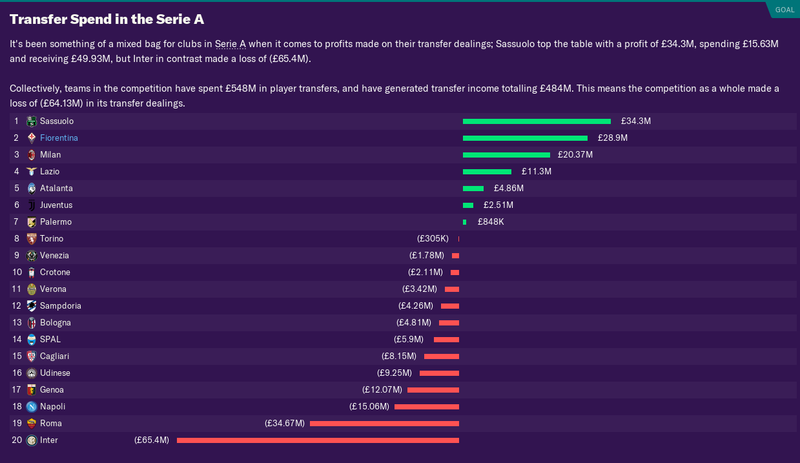 Our focus turns to the Monday night fixture against Marcelo Bielsa’s Atalanta side at the Artemio Franchi and it seems that the boys from Bergamo have done their homework on us upon inflicting us to a 1-3 defeat with us only having a Sandro Tonali consolation goal to cheer on a dismal night. Desperately keen to put the Atalanta result behind us we travelled to Venice to play bottom club Venezia and recorded a 3-0 win thanks to goals courtesy of Abdou Diakhate, Alessandro Cortinovis and Domenico Berardi to keep us on top of the table with 5 games to go. Matchday 34 brought Lazio to the Franchi the team that ended our unbeaten start to the season back in November and they come here on a good run themselves that see’s them fighting for a Champions League spot, so we knew we would have to be at our best to get a positive result and that is exactly what happened with Abdou Diakhate giving us a 1-0 win in a very tight game. Each win brings us closer to our dream and we now know that two more wins from our final four games will be enough to win the title. Our next trip takes us to Turin to face Torino who have managed to pull themselves away from the relegation battle. We got off to the best possible start when Maximiliano Romero returning from a spell on the sidelines put us 1-0 up after 8 minutes to then double our lead just 2 minutes later. Our hosts are finding it difficult to contain our attacking threat. Marco Benassi put the game to bed in the 2nd half rounding off a resounding 3-0 win that means we travel to the San Siro knowing that a victory will secure us the title. 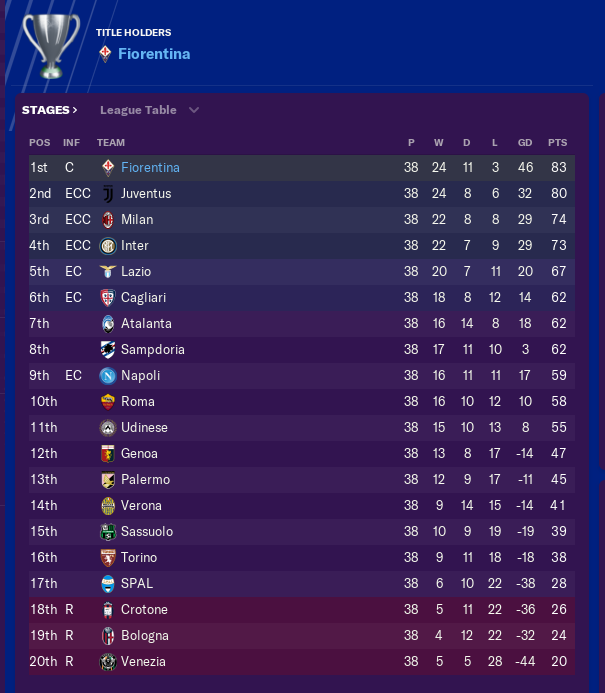 The buzz around Florence leading up to matchday 36 were we are to face 3rd placed Milan was electric. The Viola tifosi were arranging the choreography wether they had a match ticket or not. We are on the verge of becoming Champions of Italy for the first time since 1969 some 52 years ago. With Patrick Cutrone facing a late fitness test I decided to give Dejan Joveljic the nod up front and use Cutrone if required off the bench. The young Serbian was to have an experience he will never forget on a fine spring evening inside a packed Artemio Franchi when in the 26th minute he gave us a 1-0 lead with a towering header at the back post after good work out wide from Adjapong and Berardi. A great start endorsed by Domenico Berardi when he doubled our lead with a close range volley in the 37th minute. Half time and a 2-0 lead I told the boys to not get complacent, the club was 45 minutes away from winning the title. We had to dig in in the second half and when Joveljic failed to find a Viola shirt with a pass Milan pulled one back capitalising on the Serbian forwards error it was time to steady the nerves. Dejan Joveljic had experienced both ends of the scale from euphoria in the first half to disappointment in the second the young forward was looking nervous so I decided to bring Patrick Cutrone on in his place for the last 15 minutes. With the clock counting down Milan come close again but Lafont holds on to a shot from Emre Can who is on loan from Juventus. 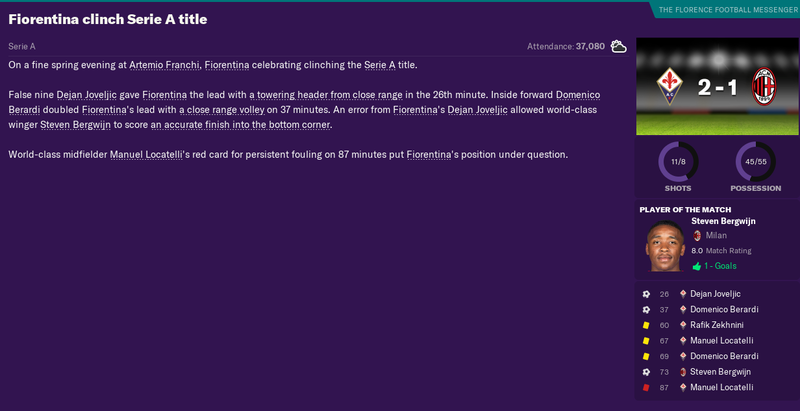 We then get Locattelli sent off with 3 minutes of normal time remaining so I bring Norgaard on to keep our defensive shape, it’s backs to the wall and then the referee blows his whistle…… it’s all over Fiorentina Campioni, Fiorentina Campioni, Forza Viola. We have done it with two games to go we are the new Champions of Italy and we have done it playing our way, it’s a fantastic feeling. Florence was still in party mode whilst we prepared for our trip to Rome to face Roma, our first game as champions and a chance for me to give our squad players a run out before our final game of the season next week in the Franchi were I will give the tifosi faithful the chance to give our Champions the reception they deserve. The game against Roma ended in a 0-0 draw but our squad players enjoyed the occasion and dominated the game but could not find the back of the net. Lafont, Adjapong, Mancini, Bastoni, Ranieri, Locattelli, Diakhate, Tonali, Romero, Berardi, Cutrone. It’s a party atmosphere but all credit to Verona they have come to spoil the party and take advantage with a goal on the stroke of half time that takes a Maximiliano Romero strike after 65 minutes to give us a 1-1 draw. 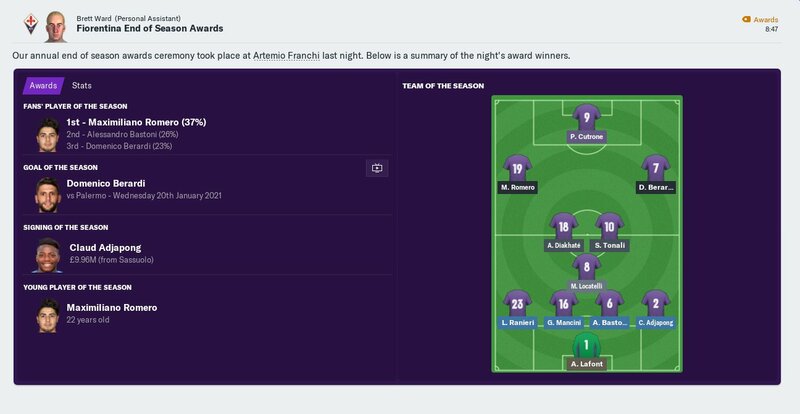 What a season for the Viola, you can see from the above that the whole squad stepped up to the plate when called upon. A season to remember that culminated with us becoming Champions playing an attractive brand of football that is getting results at all levels. Not only did we win the league but both our Under 20’s and Under 18’s won their respective Leagues with the Under 18’s completing a double after winning the Coppa. Things fell in to place nicely during the season but my favourite moments was watching Manuel Locattelli playing in the Half Back role, it was a joy to watch him drop between our central defenders alowing our wing backs to push on. One of the most notable things to watch was Locattelli’s positioning he was always available for a pass whenever anyone found themselves in a tight situation. 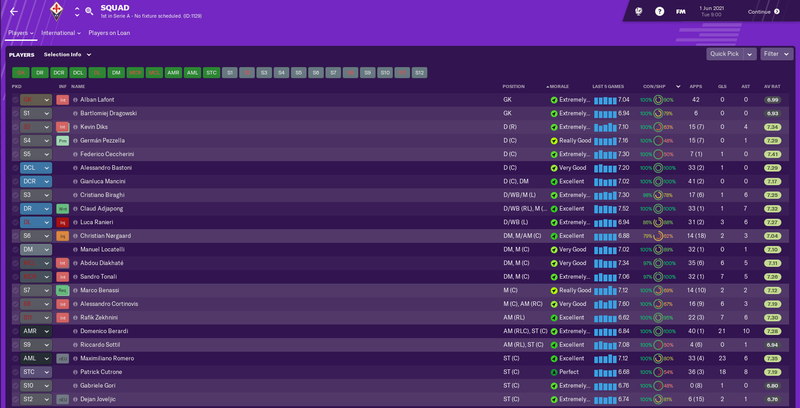 Well that concludes season 3 it’s now time to get stuck in to season 4 and see if we can replicate this season whilst plotting our way through a Champions League campaign. Thanks for reading.